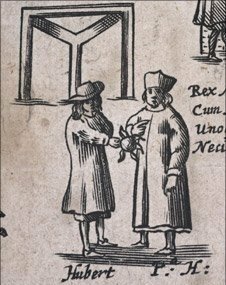 On this date in 1666, a hapless French watchmaker was hanged at Tyburn for starting the Great Fire of London — his obstinate confession in the face of all other evidence making him the convenient fall guy for an accidental cataclysm. though the Chief Justice told the King, ‘that all his discourse was so disjointed that he did not believe him guilty;’ nor was there one man who prosecuted or accused him: yet upon his own confession … the jury found him guilty, and he was executed accordingly. And though no man could imagine any reason why a man should so desperately throw away his life, which he might have saved, though he had been guilty, since he was only accused upon his own confession; yet neither the judges, nor any present at the trial, did believe him guilty, but that he was a poor distracted wretch weary of his life, and chose to part with it this way. Certain it is, that upon the strictest examination that could be afterwards made by the King’s command, and then by the diligence of Parliament, that upon the jealousy and rumour made a Committee, who were very diligent and solicitous to make that discovery, there was never any probable evidence, (that poor creature’s only excepted,) that there was any other cause of that woeful Fire, than the displeasure of God Almighty. Executed Today is pleased to interview Meriel Jeater, curator of the “London’s Burning” exhibit now on display at the Museum of London, on what the Great Fire wrought. More Great Fire images, including a map of the destroyed area, here. 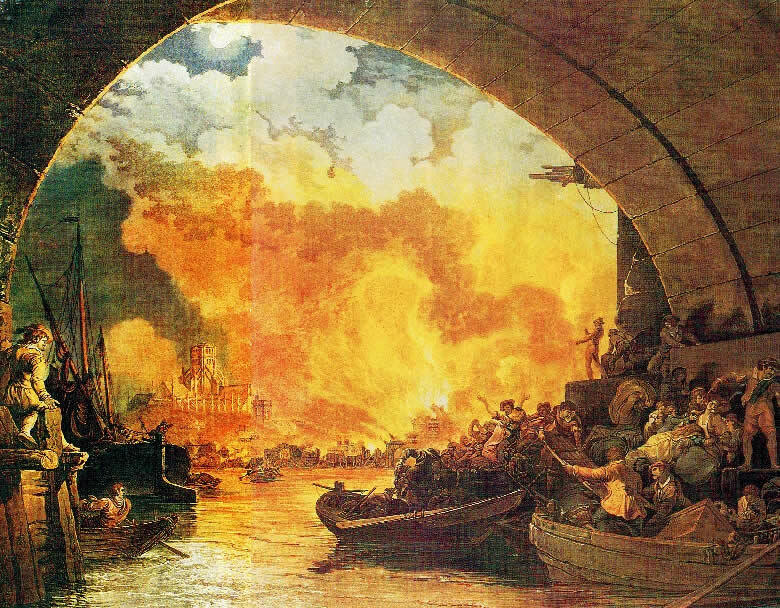 Was London lucky to have the Great Fire? Yes, I suppose so. Lots of people have sort of argued that London missed an opportunity to make more changes, but they just didn’t have the money to do them at the time. There were a lot of improvements made. They widened the streets. The city was rebuilt in brick instead of wood, although that rule was in place from before 1666. The regulations were restated and extra ones were added in; a lot of people think that it was because of the Great Fire that people started building in brick, but that regulation already existed from earlier in the 17th century. You’ve got acres and acres and acres of land that have been reduced to rubble during the Great Fire, and en masse, all these new buildings are going up. But yes, it made life more healthy & more pleasant in the city. You had pavement put in for the first time. All these little things you wouldn’t think of, like the houses had to have gassers for the first time, as opposed to just spouts that would spray water on you if you walked down the street. The Great Fire gave people the opportunity to get rid of all those inconveniences. And they were able to do other things, like the slope down to the River Thames was quite steep, and they were able because of all the rubble to ease the slope. How did it reshape London? What might have been different about the subsequent life of the city if it had never occurred? Within days of the fire going out, various architects like Christopher Wren were supplying architectural plans to rebuild London, perhaps around an American grid plan, or European-looking piazzas. Where’s the best place in London to catch a glimpse of that world, as it looked then? It’s kind of a hidden thing because of course we were bombed in the Second World War, but there are places, like behind St. Paul’s Cathedral, in Amen Court. So who is Robert Hubert? He’s a French watchmaker from Rouen, and he was seized in Essex apparently attempting to flee the country. There were various other foreign people who were seized as well, but Hubert confessed to starting the fire. But his evidence* was very conflicting; he kept changing his mind of what he’d done. He said he’d been part of 23 conspirators and put a fireball through the window of the bakery where the fire started. The baker himself said there wasn’t a window there. The jury really thought that Robert Hubert was mad, but he was so insistent that he’d done it. The following year, they discovered that he hadn’t actually arrived in London until two days after the fire started. Lucky for the baker! He didn’t end up catching any blame for burning down the city? I’ve had a little look at the records of Pudding Lane to see whether he rebuilt his house, and he did. One of the interesting resources on your site deals with the going fear of “Catholic incendiarism” (pdf), and the use of the Great Fire as a touchstone for the succession conflicts of the 1680’s. Would it have been conventional wisdom by that time, a generation or so after the event, that the Great Fire was a Catholic plot? Given the combustible material all about, why wasn’t something like the Great Fire a more regular occurrence? There were six serious fires in the 17th century before the Great Fire happened; one of them was a great explosion of gunpowder. Fires were sort of a common hazard. The thing about the Great Fire was that there was sort of a whole load of circumstances. There was a drought, so it was dry; there were storm winds coming in from the east, so it blew the fire on faster than it would have; it started at 1 o’clock in the morning, so people were in bed. I think the problem is that it’s all these circumstances combining together. Maybe if it happened at 3 o’clock on Monday when it was raining, it wouldn’t have gone beyond the block. Logistically, how did the society and the state handle the mass homelessness and unemployment that followed? Where did all these people live right after the fire, and how smoothly were they reintegrated? People were camping out in the fields outside of London; others were moving into areas that were unburnt but having to pay hugely inflated rents. Some people had to move into other towns. There was evidence that people were still living in shantytown tented accommodations up to eight years after the fire, because there’s another rebuilding regulation in the 1670s that addresses that. In the first year after the fire, only 150 houses are rebuilt; the rebuilding happens over 10 years, though some houses took up to 30 years. Some people were in very desperate circumstances, so formerly very wealthy people who had lived off their rents might now be working as servants. People coped, a lot of times in reduced circumstances from what they were used to. As curator of an exhibit, what do you hope visitors take away from London’s Burning? One thing that I really wanted people to understand as they go around the exhibition is the effect on people. You learn about it at school, but you don’t really focus on how people cope and how they rebuild. There’s also a lot of urban myths about the Great Fire, like the ‘fact’ that the fire is supposed to have ended the Great Plague, which is not the case (pdf); those are things we wanted to dispel. * There’s some original documentation from the examination of Hubert and others after the Fire here. ** Also spelled Thomas Farriner — or Faryner, or Farryner. Christopher Wren’s monument to the Great Fire of London. Like a tall bully, lifts the head and lies. ‡ Pepys’ diary, January 21, 1668.
the story is that it seems on Thursday last he went sober and quiet out of doors in the morning to Islington, and behind one of the inns, the White Lion, did fling himself into a pond, was spied by a poor woman and got out by some people binding up hay in a barn there, and set on his head and got to life, and known by a woman coming that way; and so his wife and friends sent for. He confessed his doing the thing, being led by the Devil; and do declare his reason to be, his trouble that he found in having forgot to serve God as he ought, since he come to this new employment: and I believe that, and the sense of his great loss by the fire, did bring him to it, and so everybody concludes.